Discover the enchanting beauty of St Lucia during an incredible 3-star Caribbean holiday. Take your pick from the resorts and hotels on offer and prepare for an unforgettable escape. Find your own piece of paradise with a Caribbean escape on the captivating island of St Lucia. We have a range of 4-star hotels and resorts to suit all of your holiday needs. Succumb to the tropical beauty and laid-back atmosphere of St Lucia during a 5-star Caribbean holiday that you will never forget. Here are our top picks for a sensational getaway. St. Lucia is arguably one of the most attractive islands in all of the Caribbean. This tiny settlement, based just north east of Barbados, has long been a favourite amongst honeymooners, families and couples, who are in search of a dream escape. 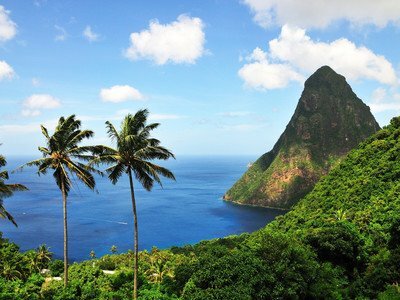 St. Lucia’s landscape is made up of luscious green valleys, luxurious beaches and expansive rainforests. Historically, the island has changed hands between the British and French no less than fourteen times. The Caribbean island has been nicknamed ‘Helen of the West Indies’, after Helen of Troy - the daughter of Zeus and according to Greek mythology, the most beautiful woman in the world. 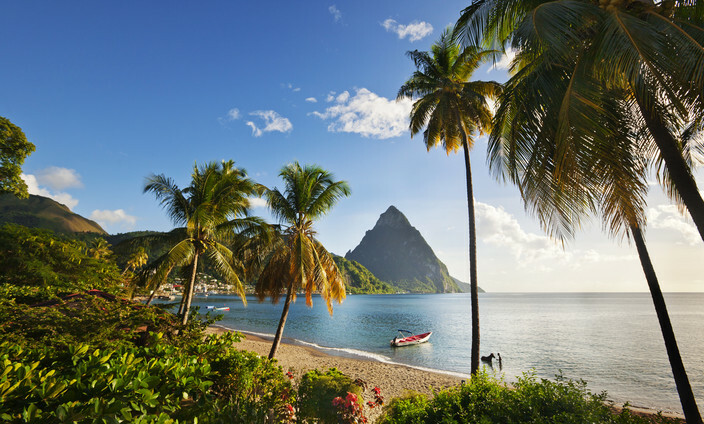 Flights: You can fly direct to St Lucia from both Manchester and London Gatwick. Packing essentials: St Lucia boasts one of the Caribbean’s warmest climates with temperatures rarely dropping below 22?°C, even in the winter months. Sun cream, sun glasses and a hat for protection is a must, as is light clothing. However, you should also be prepared for heavy rainfall and thunderstorms, especially from June through to November, so taking a light waterproof jacket would be advisable. St. Lucia’s long lasting appeal has cemented it as one of the world’s most sought after destinations for luxury holidays to the Caribbean. Both families and couples alike will love this remarkable island, which offers numerous opportunities for exploration. Whilst it’ll be hard to keep away from St. Lucia’s white sand beaches, it’s also worth venturing across the country’s mountainous inlands, including Sulphur Springs – the area is considered the world’s only “drive-in” volcano and can be found toward the south west of the island, near Soufrièr. To the east of the island you could spend a day up in the canopy of the rainforest, with the sky rides in Chassin. The adventurous can traverse specially set up zip lines and the less bold can ride an aerial tram through the inner forests of the island offering some wonderful views. Tour guides will also offer great insight into the local plant life. And if scenic excursions are for you, a trip up Gros Piton is a must while on the island. You can hike up the island’s highest peak seeing some spectacular scenery of the island and getting up close to the inner rainforest that covers the peak. Head to the east of St. Lucia to Chassin to explore the island’s rainforests, all of which can be explored via one of the area’s many aerial trams or zip lines! Frequent tours and excursions run around the region, offering an insight into the local plant life. If this sounds like your idea of fun, you may also want to take a hiking trip up Gros Piton – the second highest peak on the island. Be sure to make some time for a trip to Castries during your holiday. The bustling capital is home to some bustling markets, historical monuments and cathedrals, including the Cathedral Basilica of the Immaculate Conception. On top of cultural and historic landmarks, St. Lucia is home to your favourite holiday pastimes, including snorkelling, sailing, water sports and more! 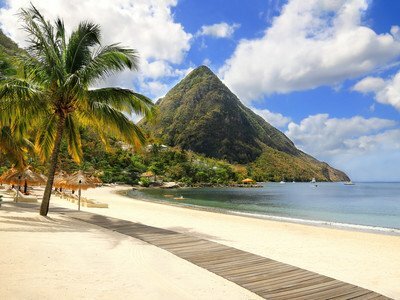 Being a Caribbean island, St. Lucia enjoys warm weather throughout the year. The best time of year to visit St Lucia is between December and March, where the temperature ranges from the mid to high twenties. There is also less chance of rain during this time. St. Lucia’s summer lasts from June right up until October. You will experience hotter weather during these months, but weather and tropical storms are also possible. You have a sense of adventure! St. Lucia’s rainforests and mountains are perfect for keen hikers. That being said, it’s also worth visiting the island for its fabulous beaches, volcanic spas and world-class resorts. St Lucia is a laidback island, and with that can come some travel complications. Thankfully, there are still a range of transport options ensuring that just about everywhere is accessible. The two main airports George F L Charles and Hewanorra operate helicopter rides to take you to various parts of the island. Most visitors will make use of the roads on the island at some point. Plenty of transfers are available from the airports, whilst cars can be hired easily from various points or through hotels directly. If you do plan to rent a vehicle during your stay, it may be worth getting a 4-wheel drive as the terrain can quickly become mountainous if you go off the beaten track. Hiring a taxi is another relatively inexpensive option and a good way to see the island without the hassle of driving yourself. Most firms have fixed rates dependent on the length of journey, but as always check with the driver beforehand to avoid any problems – and clarify whether price quoted is in East Caribbean Dollars not US Dollars. If you’re really trying to budget, local minibuses are available between the most popular towns – Castries, Vieux Fort and Soufrière. Being surrounded by ocean, it’s hard not to enjoy transport by boat and other options when visiting St Lucia. Water Taxis are a great way to either go island hopping or access secluded parts of St Lucia, whilst boats can be chartered from Rodney Bay among other popular points. Aside from the beaches, Pitons and general paradise, St Lucia is a hotbed of sport. They don’t like cricket... oh no, they love it! St Lucian’s are some of the most passionate fans of the gentleman’s game, and can often be found packing out the Beausejour Cricket Ground, now renamed the Darren Sammy Cricket Stadium - after the island’s most famous cricketing export. The West Indies side make frequent trips to the ground for international test and one-day internationals, and the stadium played a key part in the 2007 Cricket World Cup and the 2010 World T20, where it hosted both semi-final matches. In more recent years, it has been the home of the St Lucia Stars franchise, who compete in the domestic Caribbean Premier League, an annual T20 tournament. St Lucia has seen a big influx of tennis participation in recent years, with the island building a new national Tennis Centre, and competing annually in the Davis Cup. It is also home to a Commonwealth gold medal-winning high-jumper, in Levern Spencer. The female athlete won gold at the third time of asking in the 2020 Gold Coast games, and boasts an impressive back catalogue of medals from previous Commonwealth, Pan Am and Central American and Caribbean Games. A picturesque island like St Lucia wouldn’t be complete without some top golf courses. Both the Sandals St Lucia and the St Lucia Golf & Country Club boast 18 holes in idyllic settings. St Lucia can’t brag about multiple long beaches like other Caribbean hot spots, so locals and visitors sure make the most of the five-mile stretch of sand that is Reduit Beach. Ideally located close to a host of hotels, bars and restaurants in Rodney Bay, Reduit Beach is the perfect choice for a long stroll, sunbathing sessions or dipping your toes in the calm waters. There are also plenty of snorkelling, windsurfing and water-skiing options here, while the young and young at heart can take on the Splash Island Water Park, which floats out in the middle of the sea. If you want to enjoy views of St Lucia stunning Pitons, Jalousie Beach is the place for you. Situated between Gros Piton and Petit Piton, this enchanting spot could possibly be most breathtaking beach in the whole of the Caribbean. A chunk of the sand is reserved for guests of the Sugar Beach resort, but there’s still plenty of space and the opportunity to enjoy this sensational location even if you are not a guest at the hotel. Jalousie Beach is also the number one choice with adventurers looking to snorkel and scuba dive in the coral reefs off shore. 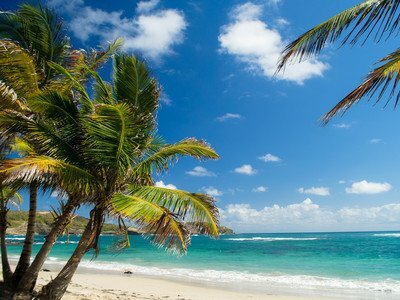 If you’re looking for a beach with lots of star appeal, you should definitely opt for Marigot Bay. This picture-perfect spot on the west coast of the island is regularly used in Hollywood films – with one being none other than the Pirates of the Caribbean! We can’t promise Jack Sparrow will be there, but the view is just as eye-catching! Not just popular on the island itself, the acclaimed event is well known across the Caribbean and even worldwide. Past performers have included some of the world’s most famous musicians including; Elton John, Rihanna, John Legend and Diana Ross. It usually takes place in early to mid-May each year, with a spectacular finale at Pigeon Island National Landmark. It could be argued that the Caribbean is just one big party, but those words couldn’t be truer than when Carnival arrives in St Lucia. Traditional steel drums and costumes that leave little to the imagination all add to the colour and sounds that will help you dance the night (and even next day) away. The Carnival usually takes place in June or July. What started out as Creole Day back in 1981, to celebrate the traditional heritage of the island, is now a month-long celebration throughout October. Find everything great about St Lucia, with music, food, street parties and of course rum. It wouldn’t be a celebration otherwise, right? January blues? Not in St Lucia, thanks to this three-day food and rum festival. Some of the island’s best chefs...and rum makers will be in attendance, alongside some top international chefs to showcase the best St Lucia has to offer.